I'm so anime I wink stars. The year was 1996. I stood atop a pile of mutilated corpses, the remains of those foolish enough to challenge me. These people had once been my friends. Now they were gone and I was the Tetris Attack champion. Had the cost been too high? This Tea Time, I'm reaching out to all Tetris Attack veterans and victims. I'm here to show you that puzzle battle games can be played responsibly and without harming anyone. I present Wind and Water: Puzzle Battles. Wind and Water: Puzzle Battles is a quasi-indie game developed by a team of two, boasting to be "one of the most extensive, challenging, and complex puzzle games ever." As the genre of competitive puzzle games is fairly underpopulated, that claim is believable. For added friendship poison, wager pogs on the outcome of your puzzle battles. Though it is an indie game in the practical sense, Wind and Water has seen release on a variety of markets that we will kindly refer to as 'second tier' for lack of a better descriptor: Korean Linux handheld GP2X in 2007 and our old friend the Dreamcast in 2008. Hang in there, Dreamie! 2011 saw its Windows release. Wind and Water offers no surprises for those with some experience in the genre. 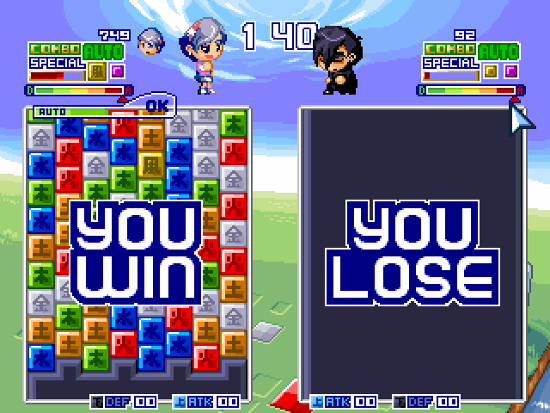 Players use a cursor to swap blocks around, grouping them together to clear the board and earn points. You compete against time, for score, or against another player or AI. Things get more complicated with a few unique block patterns that grant extra points or effects. I'm not sure what's going on but things are flashing so I think I'm winning. The controls are responsive with only a few minor unintuitive quirks - for instance, the game has a slight lag between input and reaction. It is possible to line up a block for a clear and swap it back out again before the clear occurs. This actually appears to be intentional, as quick players can use this leeway to strategic effect. The biggest gap for people without a ton of time to invest in honing their puzzle-fu will be the very complexity that the game's page touts as a feature. Wind and Water has five basic kinds of blocks to match up and the grid is set up on diamonds rather than squares. That means the cursor swaps in clockwise and counterclockwise motions, four at a time. This may not sound terribly headache-inducing, but it introduces more vectors to consider as you're lining up blocks. When time is a factor, it can be harsh. Does this Qualify as Second or Third Wave Anime Culture? For everyone who is already shying away from the words 'competitive' and 'complex', Wind and Water features a single player campaign with an estimated completion time of 30 to 100 hours. The 100 hours probably depends on how badly you need to get Rank S on stage C30-B. The story is the videogame equivalent of that old high school standby: writing about thinking about what to write. It's more common than you'd expect, trust me. 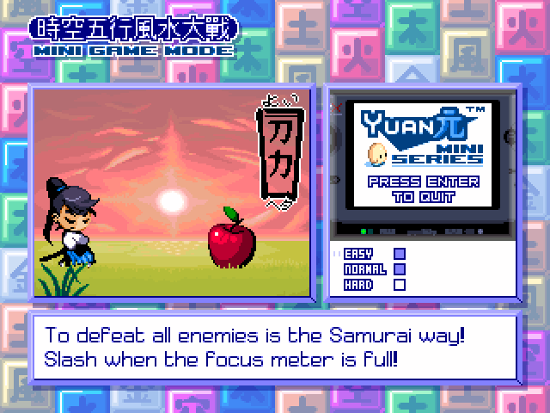 You move through various challenges and mini-games on the world map, viewing dialog sequences here and there. There's going to be a tournament and Goku wants to invite Vegeta the protagonist is tasked with getting everything ready, be that convincing the authors' avatars to finish programming and spriting or tracking down the other characters. As they stick with this conceit, it goes from lame to kind of endearing then back to lame and then back to endearing. Wind and Water is charming in a way. The environment, characters, and music are bright and peppy. They reflect the kind of unpolished, Toonami-influenced aesthetic that you'd find in a middle schooler's comp book a decade or so ago. The humor is the sort of wacky hijinks you'd expect to accompany that style. A customer review on their website used the words "pleasant atmosphere." I think that describes it well. 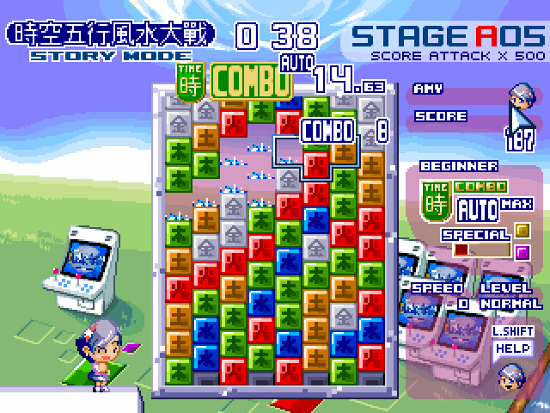 The stages all feature a different goal: score attack and time attack are present, as well as more specific things like "clear 100 red blocks" or "defeat this AI opponent." Doing well on a stage will award you more points, which can apparently be spent on items. As the majority of our two hours were taken up by a combination of tutorial and introductory stages, we never actually saw if there was anything to buy. If an hour and forty five minutes of the story mode made everything seem too easy, playing a normal AI in arcade mode is the easiest way to crush your ego. Wind and Water does its best to ease you into its world, but they weren't joking about the complexity. It's something they view as a bonus. 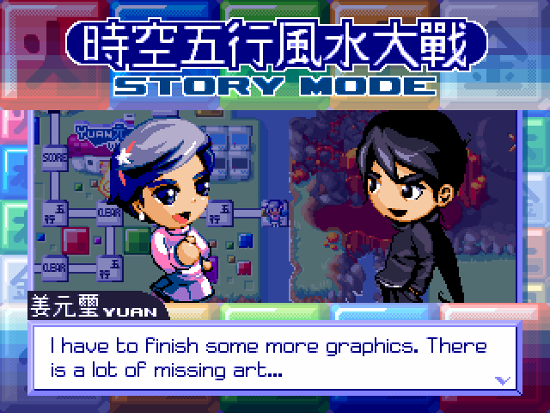 It says, "this game will take a lot of effort." Pattern recognition and button timing take a lot of experience, especially if you're starting from ground zero. Every game needs Kirby Superstar-esque minigames scattered throughout. Waiting for Call of Duty to realize this. This is definitely the kind of game that you'd lose a summer to. There's a reason you don't see things designed like that anymore: the number of people who are willing to devote that much time to a single game has decreased. Those that are left are invested in more popular genres. Wind and Water does seem to have quite a community, so for those who want to become the very best puzzle battler, here's your savior. Don't let all this talk of depth and time investment dissuade you. Wind and Water has your amateur puzzling needs covered. 30 hours looks real good at the low price of free. Ready to get over the trauma of destroying your childhood friendships? Download Wind and Water: Puzzle Battles here. Just to warn you, a trailer auto-plays with sound on that page. Want to suggest a game or genre for a future tea time? Email me at madamarcadia@aristogamer.net.